Why do we make it hard? Why do we think that cooking healthier foods always takes a long time? Relax now. My recipes are all made with real food, and most all of them are very low maintenance. 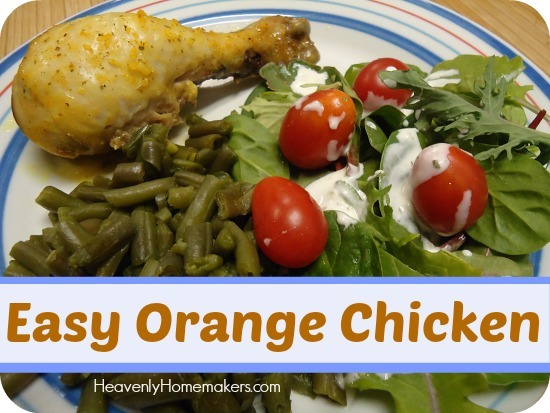 This Easy Orange Chicken recipe will prove it. 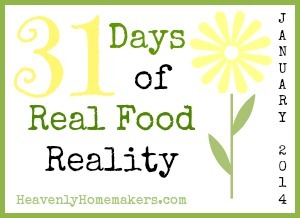 The truth is that eating a real food diet is actually rather simple. We just have to get the hang of it. We just have to plan ahead a little bit. We just have to buy some chicken – at least if you want to make this recipe. I think I had this dish in the oven after about five minutes of prep time. That’s faster than making a box of mac and cheese, and I think it goes without saying that this tastes much better. Have you scrolled through all of my High Five Recipes? If not, you should. If so, you should again. 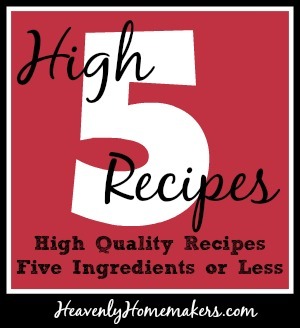 They are all high quality recipes which call for five ingredients or less. We’re talking everything from main dishes, to side dishes, to snacks and desserts. Real food. Real easy. So how about a new High Five Recipe? Place chicken legs in a 9×13 inch baking dish. Stir together orange juice and onion soup mix. Pour mixture over the chicken. Cover and bake in a 375° oven for 45 minutes. Uncover and bake for an additional 15 minutes. Pour orange juice mixture over 6 chicken boneless, skinless chicken breasts. Bake in a 375° oven for 25 minutes, then uncover and bake for an additional 5 minutes or until juices run clear. During the final few minutes of cook time for your chicken, put together two or three vegetable side dishes. Brown rice is also wonderful with this chicken. Your meal will be satisfying, delicious, and you won’t even break a sweat preparing it. Having homemade MSG-free Onion Soup Mix on hand is always super helpful. In fact, I encourage you to spend a few minutes putting together several of the seasoning mixes you’ll find on this page. They save so much time, taste so much better than purchased packets, are much healthier, and save money too! I hope you’re beginning to see that eating a real food diet really isn’t complicated. What are your favorite “throw it together” healthy meals? This recipe looks delicious and I’m adding it to my menu for next week. Your green beans look delicious too. How do you cook them? My kids only want the canned variety….. I use frozen green beans, and cook them in a pot with a little water for 5-10 minutes. Salt well and serve! LOL, Laura, did you really just admit that you didn’t put BUTTER on those green beans? LOL I’m in disbelief LOL! Ha Ha so funny. My kids used to hate the way I cooked green beans. Now I melt a couple tablespoons of butter in a skillet over medium heat, put in fresh or frozen green beans and toss in the butter, and sprinkle liberally with Herbamare (but you could use salt and pepper or whatever seasoning you want). Put a lid on and let them cook until soft enough for your liking, stirring occasionally. My kids never complain about their green beans anymore…they gobble them up! I also cook broccoli and frozen mixed veggies this way. I cook mine the exact same way! They are delicious. You might also try steaming them. A friend recommended this to me and the kids and hubby noticed a difference, like they were more tender. I also found that my kids didn’t eat green beans as well when I left them crisp tender (the way I like ’em!) so I make sure to cook them until nice and soft. Yeah I found, not that the kids didn’t like them crisp-tender, but it was like they struggled to chew them. The next day, if there were any leftover to warm up, the green beans would be more tender because they’d basically cooked twice. They had no trouble eating softer veggies, so that’s how we cook them now. Yummmmmy!! I’m on a slow cooker kick, do you think this would work in a crock pot, too? Yes, I think this would definitely work. You may want to throw them in the oven for a few minutes (uncovered) right before serving to brown them up. I’m new to slow cooking. Would you do high or low? 4 or 8 hours? Thanks! I used to eat orange chicken at a Chinese restaurant in the mall!!! I loved it but now it kind of grosses me out. Maybe this would be a good replacement. If I have to throw something together it’s usually pasta. Probably not the healthiest but everyone likes it and it can be plain or “dressed”. I usually fix frozen veggies with it. My favorite throw together meal is a Martha Stewart recipe for lemon roasted chicken with arugula salad and dilled orzo. The chicken (I use drumsticks)gets tossed with olive oil, garlic cloves, oregano and lemon wedges, then roasted. The roasted lemons are delicious squeezed over the cooked chicken. Meanwhile the orzo (I use whole wheat) is cooked and tossed with olive oil, dill and salt. The arugula gets tossed with a red wine vinegar and olive oil. Super simple by my standards, yet nice enough for company. One of our favs is Parmesan crusted chicken – so quick, easy and yummy. 1/2 cup mayo, 1/4 cup grated parmesan cheese 4 – 6 boneless chicken breasts and dry bread crumbs or corn flake crumbs. I usually add a little garlic because we love it. Preheat oven to 425 degrees. Combine mayo and parmesan cheese. Evenly top chicken with mayo mixture. Sprinkle with bread crumbs. Bake for 20 – 30 minutes or until juices run clear. I know you try to avoid aluminum foil and I’m working towards that as well. How then do you cover the chicken in this (as well as other) recipe(s)? If I think the foil might touch the food, I will lay parchment paper on top of the food, then cover with foil. Works great, and nothing sticks to parchment paper.